Our House has an Anchor: But What About Winter? As soon as people hear that we're moving our boat up north (and that we plan to stay aboard), the first question they ask is "What are you going to do in the winter?" Despite having lived in the northeast (Massachusetts) for several years, until recently (about a week ago), I, for some reason, was under the impression that it didn't snow in New York City. So, until about a week ago, I would respond to the question about winter with, "I'm sure we'll be cold, but it isn't like there will be snow, so we'll be fine." Then, whoever was asking the questing would stare at me like I was insane. I now understand why. Although Bridgeport, CT is farther north than Jersey City, NJ, I'm guessing the winters we'll be facing in the coming years will have more in common with what is pictured in the first photo than what is pictured in the second. 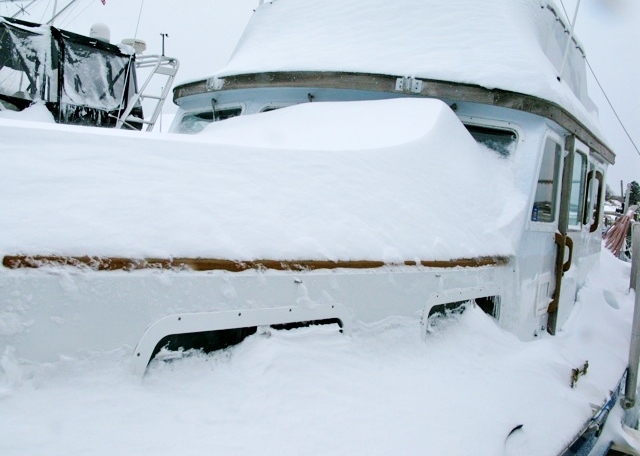 To keep our decks free of snow, we'll likely be tenting our boat in the winter. If you look closely at some of the boats in our new marina (picture can be found here), you'll see that several are wrapped in plastic. This helps with keeping both the boat warm and the decks clear of snow and ice. For good measure, I'm guessing we'll also be investing in a shovel.